It all started one afternoon in my uncle’s room on a hot and humid summer day in The Bronx in 1999. My uncle popped Princess Mononoke (Mononoke Hime) in the VCR and my brother, cousin and I sat in awe for 134 minutes. Then I watched it again. And again. And again. I fell in love with Princess Mononoke that day, and concurrently with everything that you breathed life into. Mononoke was different yet so familiar, like a story I knew I always needed to hear. There was violence, industrialization and humans juxtaposed against nature, spirits and gods. But it was all beautiful. I didn’t know who was bad and who was good. It was strange not knowing who to root for, especially at 12 years old. But then I realized that was the point. It’s rare in family films that the line isn’t distinct between the hero and the villain. Life isn’t black and white, and through your films you showed us and prepared children for the realities of the world. After Mononoke, I devoured any and everything you made that I could get my hands on, from Porco Rosso, Spirited Away, Laputa: Castle in the Sky and much more. Totoro, Kiki and Nausicaä represent a lot of your recurring themes such as reverence for nature, highlighting independence and encouraging pacifism but depicted in such magical ways. Disney had female characters, some strong, some not. But you are constantly representing strong female characters in your work. They were not always likable, but always real, and I respect and admire you for that. That is what young girls and boys need to see. You are one of the worlds greatest directors of animation and writers to grace this planet. Your films tickle my soul and you make the world a better place. I LOVEHayao Miyazaki and if you have heart and a soul you do too! For those of you who don’t know Miyazaki (you clearly aren’t from this planet) he is often compared to being the Walt Disney of Japan and his career has spanned over 50 years. He’s made incredible movies through Studio Ghibli, which he also co-founded. One of his films, Princess Mononoke, was the highest grossing film in Japan until Titanic trumped it in 1997. Other prominent films (even though they all are prominent) are Spirited Away, Kiki’s Delivery Service, My Neighbor Totoro,Ponyo and so much more. Most of his movies have similar themes although very different and imaginative story lines. If you haven’t seen his movies I hereby declare it your life’s’ mission to buy them, rent them, find them now and indulge yourself in the glorious world of Miyazaki! But first check out these My Neighbor Totoro tattoos! 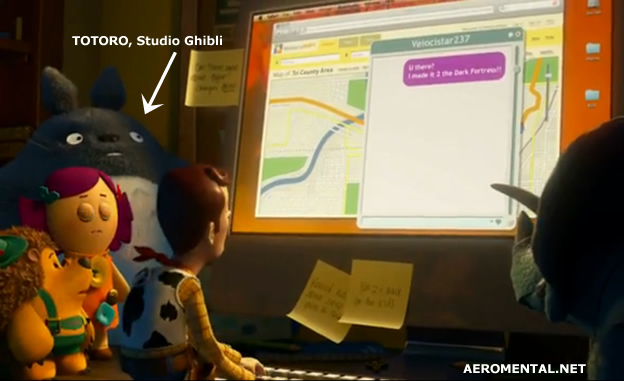 Oh and Totoro made a cameo in Toy Story 3!